Dual Credit courses allow high school students to enroll in college-level coursework and potentially earn credit at both the high school and college level simultaneously. Courses are taught by high school instructors who are approved by the college. Curriculum, syllabi, and textbooks also meet college guidelines. District 230 works closely with Moraine Valley Community College to provide opportunities for students to earn college credit while attending high school. Students and parents should check with Moraine Valley’s Dual Credit Site and their school’s guidance counselor for additional requirements. Students interested in completing correspondence coursework, including online courses through Illinois Virtual High School, should contact their guidance counselor regarding this option. Courses are offered based on economic and enrollment factors. The semester in which a course will be offered will be determined after the registration process. The typical course load includes six academic periods as part of an eight period day. The other periods in a student’s schedule are designated as Advisory/Intervention/Enrichment and lunch. Students are placed into courses based on a variety of academic factors including, but not limited to: teacher recommendations, grade history, and standardized test scores. Contact the department administrator if you or your child has a question about a course placement. Students who drop a class during the first nine weeks of a semester will not be penalized. The course will be removed from their record. Withdrawal will be permitted only with parent and staff approval consistent with District guidelines. Students who drop a class during the first nine weeks of a semester will be placed in a study hall and will not be permitted to transfer from the dropped class to another class. Students who drop a class after the first nine weeks of a semester will receive an “F” unless illness necessitates a reduced course load, in which case the course will be removed from the student’s record. Students who have failed a yearlong course the first semester may be placed in an alternative second semester course if space is available. If space is not available, students will be placed in a study hall. Be in 11th or 12th grade unless approval is given by the Building Principal. The student must have satisfactorily completed stated prerequisite courses in a particular area. The student must have displayed the maturity and initiative to carry out the project. The student must have achieved a cumulative grade point average of 3.0 or higher in the sequence of studies he/she has pursued. 1. A student must declare his/her intention to use this option before the end of the first nine weeks of each semester by completing the appropriate form. 2. Students earning a grade of C or higher will receive a grade of “P” (pass). A student earning less than a “C” will receive the earned grade. The Pass/Grade option is available during a student’s 11th and 12th grade year (Driver Education can be taken Pass/Grade at any grade level). The purpose of this option is to allow students the opportunity to take elective classes without the grade affecting his/her GPA (Grade Point Average). The Pass/Grade option is available during a student’s 11th and 12th grade year (Driver Education can be taken Pass/Grade at any grade level). The purpose of this option is to allow students the opportunity to take elective classes without the grade affecting his/her GPA (Grade Point Average). Pass/Grade may be used to satisfy the initial NCAA eligibility requirements, but students may be given the high school’s lowest passing grade (CHSD230 = D-). The School Code of Illinois, Section 27-8 and District 230 require adherence to the following health standards established by the Department of Public Health. 1. All students entering high school for the first time must have a complete physical examination reported on the prescribed Department of Public Health / Illinois State Board of Education form, before the first day of school. 2. All immunization dates, including those received as an infant, must be recorded (month, date, year) on the top portion of the physical report form. They must meet recommended standards of Illinois Department of Public Health and be signed by your physician or health care professional. Tetanus boosters are necessary every ten years. This immunization must be updated when necessary in order for a student to enter school. All students enrolled in Illinois schools must show proof of having received (2) doses of measles on or after first birth date. Please pay special attention to the last polio booster that must have been given on or after the 4th birthday. Hepatitis B series of 3 doses are required. We will strictly enforce these requirements. 3. Dental examinations are strongly recommended, however, these may be submitted at a later date. Lack of a dental exam will not prevent a student from receiving his/her schedule. The health of your children is as important to us as their progress in school. Please make arrangements with your family physician, clinic and dentist to have the necessary examinations obtained so that your children may receive their schedules on registration day. SCHEDULES WILL NOT BE DISTRIBUTED WITHOUT PROPER PHYSICAL AND IMMUNIZATION DOCUMENTATION. If your student requires medication at school or adaptive physical education classes, you must contact the school nurse for further information. 1. The higher of the two grades will be used to compute the GPA. 2. Both of the two grades will remain on the transcript. No credits or qualifying points will be issued for the lower grade. 3. “Withdrawal from Class” guidelines will apply, however, there will be no GPA penalty for an “F” withdrawal grade or “F” semester grade if the student takes the class a second time. 4. Students and parents should complete the appropriate form in order to participate in this option. 5. Students failing a required course must retake the same course for credit. The ability to change a student’s schedule after registration is limited. For that reason, students are urged to consider their selections carefully. No changes will be made to accommodate requests for specific teachers or periods. CREDIT is a measure of school achievement. A student receives one-half unit of credit for successful completion of the work in a course that meets daily for one period, for one semester. A student receives one unit for successful completion of the work in a course that meets daily for one period for a full year. A PREREQUISITE is a course or a condition that a student must successfully complete or meet requirements of before the course may be taken. A REQUIRED COURSE is a course that a student must successfully complete in order to earn a District 230 diploma. An ELECTIVE COURSE is a course that a student may choose to take in order to earn a credit toward a District 230 diploma. District 230 uses a weighted grade system which adds additional weight to grades in Honors/Advanced Placement courses with a grade of “C” or better. Courses taken at a community college as an extension of District 230 honors sequences will receive weighted grades similar to District 230 Honors courses. 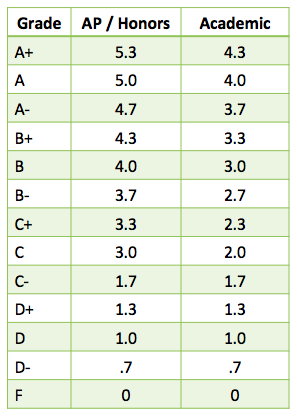 This grade point average is based on a 4-point scale for Academic and Basic classes and a 5-point scale for Honors and Advanced Placement grades of C or higher (see chart below). The GPA and percentile band will apply for all approved out-of-district and in-district uses. A limited offering of courses are scheduled for zero hour at each school with limited transportation availability. Students should check with their guidance counselor to determine appropriate placement in a zero hour course.